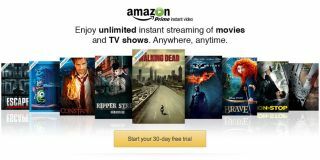 Amazon to launch free, ad-supported video streaming service | What Hi-Fi? Amazon is about to raise the stakes in the video streaming market with the launch of a free, ad-supported service separate from its current offer – if new reports from the US are proved right. The New York Post has claimed the online retail giant is going to up its game against rivals like Netflix with the apparent new service, and sources are confident such plans are in the offing. And though a free, ad-supported service will sit next to the service bundled into Amazon Prime, it's thought the retailer will use its free service to encourage more Prime membership sign-ups. A source told the NYP: "The main point is to bring in more users that you can eventually up-sell to Prime, or to get to a broader audience that doesn’t want to pay for Prime, in order to increase their video share." An Amazon spokeperson, however told TechCrunch: "We’re often experimenting with new offers and experiences for customers, but we have not announced any plans to offer an ad-supported video streaming service." It's not the first time that reports have linked Amazon with a free video streaming service, but the market continues to grow and transform our viewing habits – and may well encourage Amazon.